San Antonio clearly thinks the game differently than the rest of the league. The Spurs' decision to double down on midrange, however, could prove to be the genesis of a traffic jam rather than a revolutionary tactic. Think of an NBA offense in terms of concentric arcs. The court is already drawn that way with the restricted area, the top of the key, and the three-point line. Between them are other, implied arcs, along which screeners move and shooters curl, whether they're fully cognizant of it or not. The balance between those arcs dictates the health of an offense. Where players take their shots matters a great deal, but not quite as much as where they live; functionally speaking, there may be no factor more important than the spaces where a player can operate comfortably. A brilliant coaching staff could scheme a perfectly spaced offense only to see it buckle under the weight of a single wing who can't quite shoot. An expertly designed set might fall apart if a big isn't suited to working from the elbow—or if a stretch big is asked to set up as a finisher near the rim. The best offenses work across levels. Every player doesn't have to be effective from every zone, so long as a lineup has the spatial diversity to keep opponents honest. San Antonio clearly thinks the game differently. After running one of the more crowded offenses in the league a season ago, the Spurs have doubled down on congestion by trading Kawhi Leonard and Danny Green for a package built around DeMar DeRozan. Gone are two of San Antonio's best perimeter shooters. In their place, DeRozan—a bastion of the mid-range game—will vie for the same arcs and spaces used most by LaMarcus Aldridge. It would be difficult to watch the 2017–18 Spurs and conclude that they needed more players floating in intermediate spaces. Yet considering how few consistent three-point shooters San Antonio has on its roster (even after accounting for the arrival of Marco Belinelli and the return of Davis Bertans), one can see the value in adding another creator accustomed to making tough shots in tight spaces. In terms of how he generates his offense, DeRozan is not all that far from Leonard. Both are disciples of Kobe Bryant: wings who pull-up and pivot their way into bucket after bucket, often overcoming a rather considerable degree of difficulty. That skill set doesn't even cover the half of what once made Leonard so effective for the Spurs, though it does offer a vague outline for DeRozan's fit. For as much as San Antonio is revered for "play the right way" orthodoxy, isolation play has fueled its offense for years. Leonard was a conduit for that, as is Aldridge. The only reason the Spurs kept afloat during Leonard's bizarre absence last season was that Aldridge had the most efficient overall offensive season of his career while using 43.4% of his possessions in the post, per Synergy Sports. The fact that DeRozan is no stranger to that sort of cleared-out creation reflects a particular sensibility. One might find objection in San Antonio's methods, but those methods, if nothing else, seem quite clear. Think of San Antonio's offense as a distant relative of Houston's. The two might turn Thanksgiving dinner into a drag-out debate over the value of the three-pointer, but beneath everything else they can at least agree on certain fundamental truths. After years of revolutionary, floor-stretching basketball, success in the current NBA climate has come to depend—curiously enough—on the ability to score against mismatches. A team's offense must be structured in a way that forces an opponent to make compromises, and the players must then be skilled enough to punish those compromises as directly as possible. The Rockets, however, have math on their side. The threat of the three hangs over everything they do; if it weren't enough to have some of the best isolation players in the league, Houston elevates their play by setting up quick actions and stationing shooters all around the three-point line. San Antonio will rely on a more delicate premise. Once the Spurs get DeRozan or Aldridge in a position of advantage, they'll have precious little time to capitalize before the defense closes in around them. It's a lesser version of the same basic concept, albeit without the mathematical edge or the very necessary support structure. That sort of approach will be an effective counter on some nights, but too cumbersome on many others. 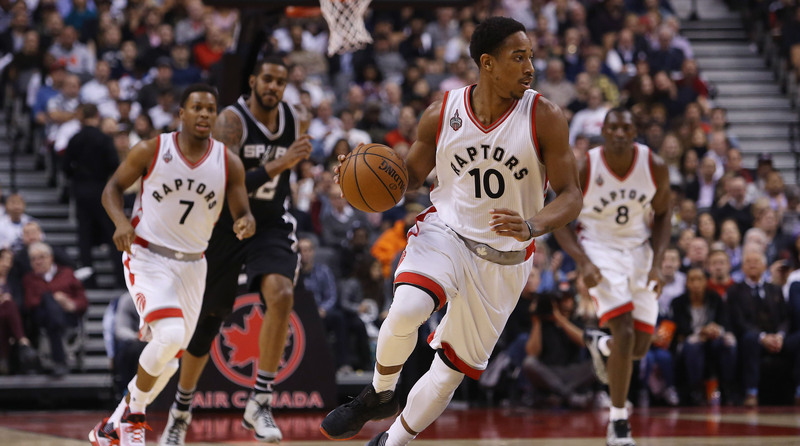 DeRozan's talent alone can't account fully for what was a below-average offense last season. His shaky defense—in place of Green, much less Leonard—will offset some of that improvement. More still will be undercut by redundancy. Both Aldridge and DeRozan are more versatile than they're given credit, but both gravitate toward scoring in the same, static style from the same, static spaces. They're not just spatially redundant, but functionally so. The pick-and-roll gives DeRozan and Aldridge some means of direct interaction, but without the kind of divergence that makes that play so effective. Ball screens are at their most effective when they make a defense account for two forces moving in opposite directions. DeRozan stepping into a pull-up jumper while Aldridge pops for a mid-range jumper not a few feet away hardly qualifies. There's enough talent between them to make something of that framework, just not at the level that San Antonio will likely need. It's notable that DeRozan, for all his shortcomings, was easily the best player involved in the rumored trade offers for Leonard—a considerable get for a team this short of offensive talent. At issue is the extent of his overlap with Aldridge and the rest of the Spurs. What is Rudy Gay, if not a lesser DeRozan? What lanes will be available to Dejounte Murray with yet another questionable three-point shooter playing big minutes? What space will there be for Lonnie Walker to drive or Pau Gasol to make moves of his own? The mid-post and the elbows will be so consistently crowded that it seems intentional—as if the court's natural occupancy limits held some untapped potential. More realistically, the Spurs might find their new roster holds all the virtues of a traffic jam. What's Next for the Spurs After Trading Kawhi Leonard?